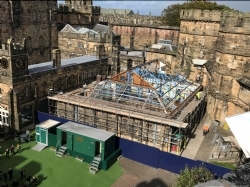 Preparatory work for the next phase of development at Lancaster Castle started on site at the beginning of September and the careful demolition of the Visitors Building is almost complete. Scaffolding is now being erected to allow for the painstaking removal of stone to the rear curtain wall so that this can be lowered to its original height. Once completed, this work will allow for a much better view of Lancaster Priory from inside the Castle, restoring historic sightlines and reinforcing the link between these two important and iconic landmarks. The removal of the Prison Visitors Centre will reveal the historic Kitchen Courtyard, the Male Felons and Kings Evidence Towers and the former Prison Hospital building, allowing these historic buildings to be brought back into use. The project is scheduled for completion in June 2019 and in the interim the shop and tour guide ticket desk have been moved to the ground floor of A-Wing. Here visitors can also view a standing exhibition of prison life in a number of the cells while they are waiting to start the tour. The Duchy of Lancaster has appointed MC Construction as lead developer for the scheme which was designed by architectural practice BDP. Quantity surveyors Appleyard and Trew are also key members of the project team, with other specialist sub-contractors and heritage partners brought in for specific tasks as the project progresses.